Are you enthusiastic about watching and reporting weather? Do you want to learn more about how weather impacts our lives and the environment? Then CoCoRaHS Canada is for YOU! • NON-PROFIT, Grassroots, volunteer network of weather observers of all ages and background measuring and mapping precipitation (rain, and snow) in their communities. • Our Web page provides the ability for our observers to see their observations mapped out in "real time", as well as providing a wealth of information for our data users. • A desire to learn more about how weather can effect and impact our lives. 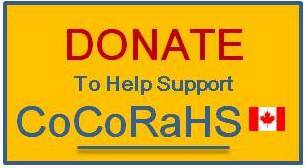 CoCoRaHS is used by a wide variety of organizations and individuals. Environment Canada, other meteorologists, hydrologists, conservation authorities, emergency managers, city utilities (water supply, water conservation, storm water), insurance adjusters, engineers, mosquito control, ranchers and farmers, outdoor & recreation interests, teachers, students, and neighbors in the community are just some examples of those who visit our web site and use our data. Where Do I Register to CoCoRaHS? Where Do I Purchase a CoCoRaHS Rain Gauge?